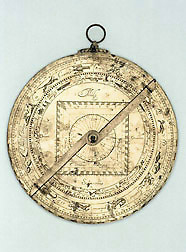 The association of this instrument with the well-known French maker Philippe Danfrie is based on its similarity to the paper astrolabes printed from plates prepared by Danfrie in 1584 (see Epact 71341), as well as a general similarity to Danfrie's work. There are no separate latitude plates, but only a projection for 48? - suitable for Paris - on the main body of the instrument. Neither is there the customary raised limb. One charming feature of this instrument is the two sets of engraved representations on the zodiacal calendar on the back. One illustrates the constellations, which is not so unusual; the other depicts the activities appropriate to each month, which is seldom found.